SALEM — The War to End All Wars officially ended at the 11th hour on the 11th day of the 11th month in 1918 — now 100 years later, Salem historians plan to commemorate that day with a display of artifacts from the Great War and the wars that followed. 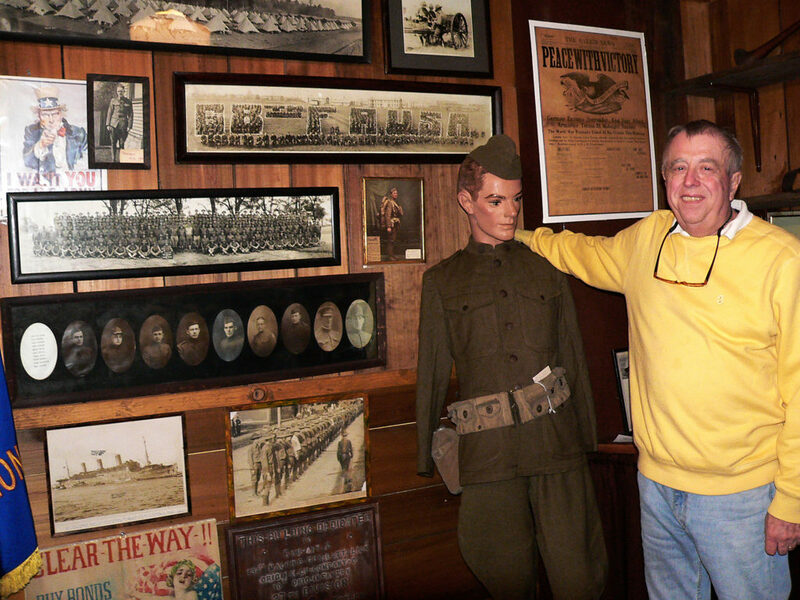 The first floor of Freedom Hall, located on the Salem Historical Society campus off of East Pershing Street and Dale Shaffer Way, will be open from 1 to 4 p.m. Saturday and Sunday, featuring a collection of uniforms, photographs, letters, soldier lists, equipment and other memorabilia. Visitors are asked to make a donation, with all veterans admitted free. Sunday is Veterans Day –the 100th anniversary of the end of World War I — and educational tours leader Jerry Laska said the Salem Historical Society wanted to honor veterans while also marking the centennial celebration. “The great thing about history is it’s a great teacher. How will we know where we’re going if we don’t look at where we’ve been? The past is prologue,” he said. The actual quote came from William Shakespeare from “The Tempest” when he wrote “What’s past is prologue,” meaning it sets the stage for the future. 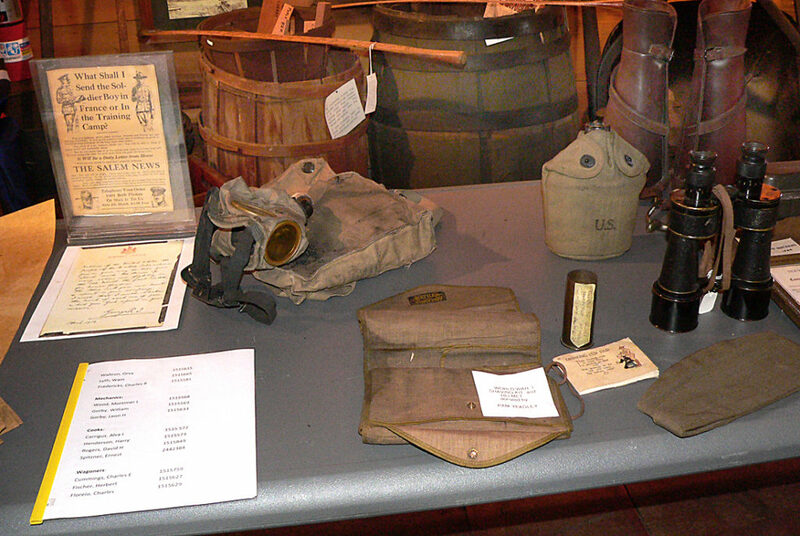 This table displays some of the equipment a World War I U.S. Army soldier, referred to as a doughboy, would carry with him, such as a gas mask and binoculars. To the left is a letter that was sent to U.S. soldiers from King George V, thanking them for their service during the war. “Whether you like history or not, it’s part of our culture, it’s part of us,” Laska said. The display includes a replica of a doughboy, a soldier from World War I in full uniform. There’s also a photograph of U.S. Army Capt. Percy Tetlow, who organized and commanded Company D in Salem, which was part of the 10th Ohio Infantry and the 37th Division. 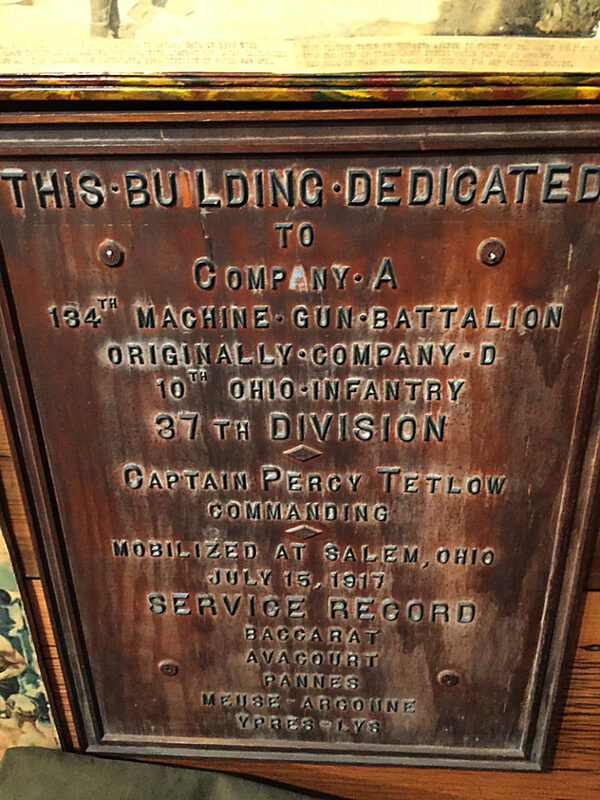 Men from Salem and all over Columbiana County mobilized on July 15, 1917 and eventually became known as Company A of the 134th Machine Gun Battalion after heading to France to join the war. A plaque commemorates the group’s efforts, listing the company’s service record which includes the Meuse-Argonne Offensive, one of the final battles of the war for the Allies and one of the largest battles involving American troops. There’s a photo of the ship that took them to France, known as the U.S.S. Leviathan. There are photographs of sausage balloons or barrage balloons which were used to defend those on the ground from an enemy aircraft attack. There are lists of names of the soldiers who served during World War I from the area, at least the ones the Salem Historical Society knows about. “If there are descendants living here, this was not that long ago, I’m sure they’ll recognize the names,” Laska said. Some of the artifacts include the equipment a soldier typically carried with him, such as the familiar doughboy helmet and the gas mask. This plaque recognizes the company of soldiers mobilized in Salem on July 15, 1917 to fight in World War I in France. There’s even a copy of a letter dated April 1918 sent to the company of Salem soldiers as a thank you for their service, signed by King George V himself. A woman donated an Army uniform from World War I that had been perfectly preserved in a trunk and there’s also a World War I Marine uniform that looks very similar to the dress uniform Marines wear today. Besides the World I material, visitors can also see artifacts from World War II, the Korean War, Vietnam and Desert Storm. All materials have been donated. The museum has all types of medals, including a Purple Heart, and a U.S. Army WAC uniform which is representative of the women who served during World War II. Laska recently donated a rare find from a flea market — a piece of silk material from World War II that features a very detailed map for Belgium and Germany used by aviators to figure out how to find their way out of danger. A former sociology teacher at Youngstown State University and family counselor, Laska serves as the head of educational tours for the Salem Historical Society and oversees the hands-on history program in the summer. Visitors can come in from Pershing Street and park near the museum or park near the Dale Shaffer Research Library or the municipal lot off of Lundy and walk up. While Freedom Hall is open, the gift shop at 239 S. Lundy Ave. at the Dale Shaffer Research Library will also be open. To learn more about the Salem Historical Society, visit the website at www.salemhistoricalsociety.org or visit the Facebook page.